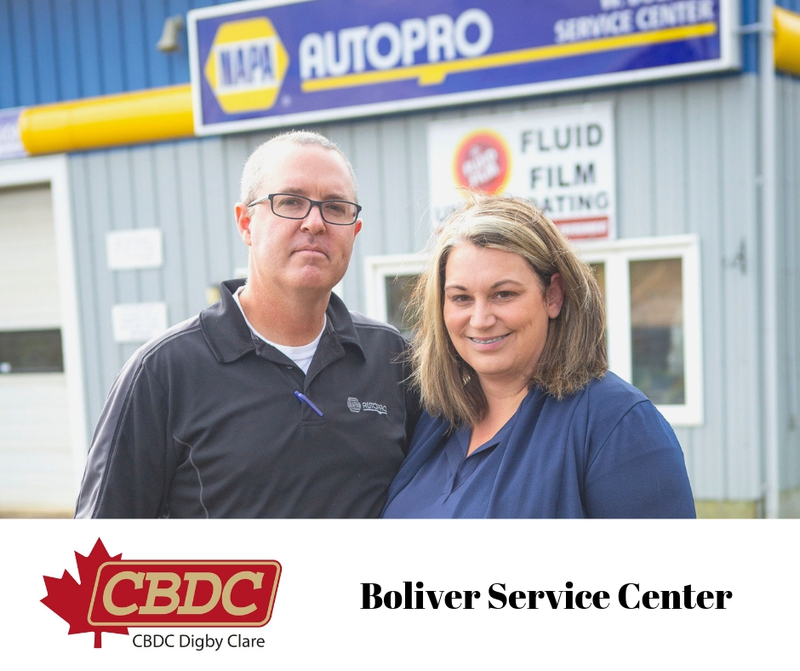 When Sonya and Jason Frost looked to buy Boliver Service Centre in Digby in 2014 as part of their family’s succession plan, they found little support among bank lenders. This was despite the fact the auto repair and maintenance business had been thriving and was a well-established company in operation for nearly 30 years. “The banks wouldn’t touch us. Our accountant was like, ‘Oh, this is an established business. This should be no problem.’ “But no, the banks wouldn’t look at us. Wouldn’t give us the time of day,” recalls Sonya. They turned to the CBDC in Digby-Clare and haven’t looked back since. The Frosts secured a loan through the organization for $120,000, which allowed them to purchase the building premises from Jason’s step-father, Wayne Boliver, who launched the company in 1985 and moved it to its current premises about 15 years after that. As well, it allowed the couple to make an initial payment toward purchasing the business itself from Wayne in a longer-term succession plan. “We knew that Wayne had built a great business. We knew that it had the clientele. And we didn’t want somebody else just coming in and taking what he had built. That was one reason why we wanted to buy the business,” explained Sonya. “The second reason is we’re both managerial-type people and no better way to own our own business than to take over one that was existing and that we knew.” Nonetheless, Sonya admits she was “scared to death” by the debt load. “We knew that [the company] was established, but still it was pretty scary,” she says. However, the couple had some experience and training in the trunk, so to speak. Both had taken business studies at the Nova Scotia Community College Kingstec Campus in Kentville and went on to work in managerial roles at Staples in Halifax. They returned to the Western Shore, where they both grew up when Sonya was offered a job running a new Staples store in Yarmouth. Jason began working for his step-father in Digby. It was an opportunity for him to test-drive the business and see if he might like to buy it when Wayne retired at 65. Well before then, however, the couple had children, Sonya left Staples, and came on board at Boliver Service Centre to help with the bookkeeping. They ran the operation for him until 2014, when he turned 65. “And we went to CBDC for financial help.” They had gotten nowhere with the banks. “I didn’t find they were very accommodating, especially to start-ups,” says Sonya. Sonya runs the business and administration side of the company while Jason oversees customer service, ordering spare parts and managing staff and work schedules. And the company is going from strength to strength, according to Sonya. “It’s been great. Our first year’s sales were phenomenal. It was more than we had anticipated when we built into our original business plan,” she reports. While it might be expected that a business may experience a bit of a lull after it’s been in operation for a while, Sonya confirms “we’ve had continual growth every single year.” She believes their continued success is due, in part, to a stream of new people moving into the area from western Canada and Ontario, where they’re used to seeing the AUTOPRO banner, which is their banner company and the source of all their parts. “When they’re Googling ‘AUTOPRO’ in Digby, our name comes up. Or if you Google ‘garage’ in Digby, our name comes up.” Moreover, she says, word of mouth is getting around by satisfied customers. While Sonya believes she now would be able to get credit from a bank, as the business continues to grow, and they look to upgrade and expand with things such as a new hoist, which can run $10,000 and up, and an undercoating bay, she would turn to the CBDC in the first instance. “The comfort level that I have at CBDC and the workers that are here locally, I would probably go to them and look for guidance. And that first,” she says. “I would not hesitate to pick up the phone, and I know that they would give me, would point me in the direction that I would need to go, whether it was a financial need, or a Human Resources need. “I truly feel that they are there to support us in all aspects to make our business successful," says Sonya.